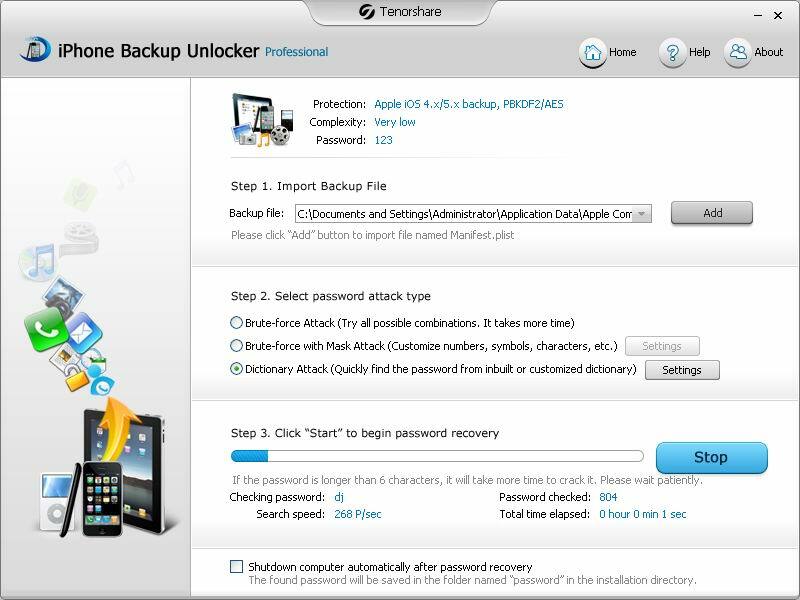 Tenorshare iPhone Backup Unlocker Professional is able to help you recover lost iTunes backup password for iOS devices including iPhone, iPad, and iPod, and enables forensic access to address books, call logs, SMS archives, voice mail and email account settings, applications, and so on in these devices. Tenorshare iPhone Backup Unlocker Professional, the enhanced version of Tenorshare iPhone Backup Unlocker Standard, has applied GPU acceleration technology which greatly speeds up the decryption process. It has won great reputation among users for its user-friendly interface, timely after-sales service as well as its extremely competitive price. - Crack iPhone backup password and enable you to access your data successfully. - Compatible with all versions of iTunes (including 10.6) and iOS (including iOS 6). - Enable access to password encrypted iPhone backup files. - Much faster speed in cracking iPhone backup password with GPU acceleration when one or several ATI or NVIDIA video cards are installed. - Supports AMD Radeon HD 7000 series and NVIDIA GTX 580. - Friendly interface with functions respectively divided and step to step user guide. - Free technical support and full money-back guarantee. - Reliable and 100% risk free.